located between Avignon and St Rémy de Provence, this house is a superb and luxurious holiday home located in the countryside just 1.5 km from the city center. The house has a beautiful fenced garden where there is a beautiful and very original private swimming pool with Jacuzzi, bench in the water and a part of the beach. bed in 90 and a cot. The house is equipped with a refreshing floor. Miscellaneous: pets allowed on request - supplement 35 euros per animal. In low season, electricity consumption may incur additional costs (from the 1st week of September to the 4th week of June included). Excellent, convenient location for day-tripping to nearby sites... Avignon, Nimes, Orange, Arles, Menerbes, Pont du Gard, Glanum, etc. Wonderful kitchen, fabulous private grounds with pool. Beautiful villa. We had a wonderful holiday, the weather was terrific. Fabien was very helpful. We found it hard to turn showers down as the water was very hot, it would be more practical to have a door rather than curtain on downstairs shower as it stuck to you every time you showered. We spent a very happy week at the delightful Mas Le Macaju in the first week of July. This is a property that will particularly suit a family with young children, looking for somewhere more contemporary than rustic, comfortable, safe and within easy reach of the towns and villages on the western edge of Provence, 20 minutes from Avignon and about an hour to the airport in Marseille. The owner, Fabien, speaks heavily-accented French and barely any English but is very accommodating and responsive, and clearly takes great pride in maintaining the property. The house was spotlessly clean and the facilities excellent - a beautiful pool, a lovely shaded outdoor bbq/dining area, a modern laundry and well-equipped kitchen. Lounging by the pool, reading a good book and drinking copious quantities of rose was no hardship here! 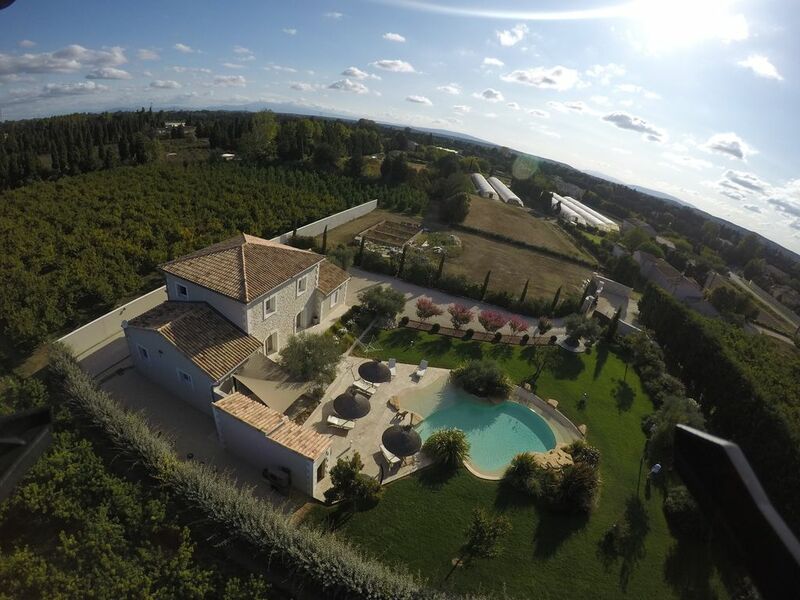 Great location for seeing sights in Provence and a beautiful property with great amenities. This home is situated near sights worthy of visiting: Les Baux des Provence, Gordes, Fontaine de Vaucluse, Arles, La Camargue, Parc du Luberon and Avignon. The house offers 5 bedrooms (1 is a small bedroom for children). Four bedrooms have a shower and sink. There are two toilets (WC), one per floor. We had 8 in our party and this arrangement helped us get out door quickly to see sights. The pool is magnificent - we spent days around the pool lounging. It was a highlight of our days. The owner was very responsive (he lives nearby) to our questions and always helpful. Our only feedback is that we recommend the owner put on paper in English the directions for pool (lighting, waterfall etc), water heater, regulating temperature of shower, and recommendations for nearby restaurants. This would allow renters to manage on their own. We would love to return to this property. A stunning villa set in beautiful grounds everything we were looking for - delighted!!! One is never sure what to expect- this villa met all and more than our expectations. The villa is only 4 years old and beautifully finished with everything we needed for our family holiday. It is surrounded by nectarine orchards and close enough to Chateaurenard to be able to pop in for any food, wine etc. The owner - Fabien- met us on our arrival to explain all we needed to know about the villa. He and his family- we met them later in the week- are absolutely delightful people, we had a couple of questions after our first day and sent him a message, he immediately replied and called in to the villa within a couple of hours to see us. We highly recommend this villa and will certainly book it again for our next family gathering. Fabien's vacation home in Chatearenard is fantastic! The pictures are great but the reality is even better. The home is beautifully maintained and very well equipped for comfort. The grounds and pool are like a high end resort, but you have it all to yourself. The property itself feels private and secluded but is very handy to the town of Chateaurenard (great little shops for supplies) and only 10 minutes from Avignon. This is also an ideal location if you are interested in wine touring. In the heart of the Rhone and not far from coast it makes an excellent home base. Fabian is a wonderful host and truly wants his guests to have a memorable stay. I HIGHLY recommend this property at the risk of it not being available for our next visit!